Here's to a fun sunny weekend all! Love this! So, so cute. It's been kind of gloomy here in LA. And I'm heading back to Chi just in time for RAIN! :) Lovely. Glad you read the post about my mole removal. Really -- perfect timing right before running all over the city without sunscreen. 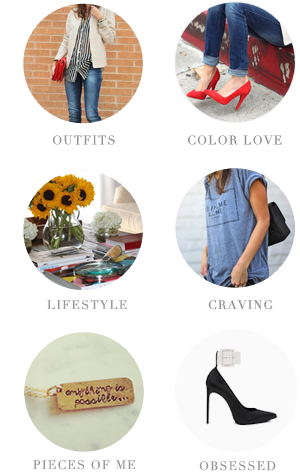 The most important blog post I have ever written! I'm one of those SoCal girls whose always complaining about the weather...but I must say I'm loving this June Gloom since I'm totally not over my knits yet. 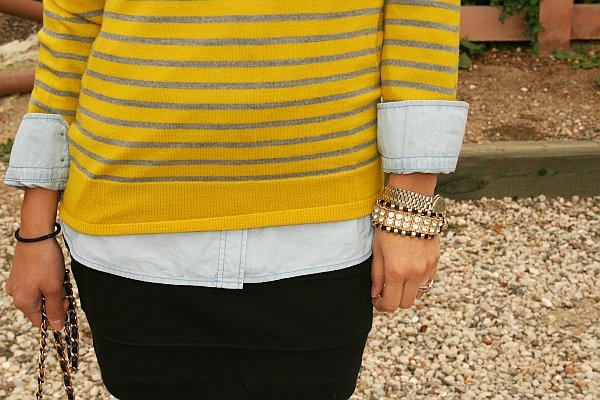 And from the looks of it, neither are u :D love that bright shot of yellow against the sea of grays...preppy chic babe! wow i always love your outfits!! you have the ability to mix things up so perfectly! love your style! following you. perfection yet again. that necklace is incredible too - f21 good job. Usually I'm not a fan on the androgynous look but I love this outfit on you! Have a great Friday! You are wearing one of my favorite color combinations, yellow and grey. Have a fun weekend too lady! The necklace and shoes work so well together, they both make the outfit a bit edgy which I love. This is a darling look! I adore how you embellished it with the statement necklace. haha yes the weather has been mediocre at best but I love the yellow! I missed you yesterday! I'm glad you're back with a nice sunny sweater though. Hope the weather turns around for you this weekend. Oooh, this is perfect - I love how the necklace sort of doubles as a classy bolero. Awesome! adore this outfit!! the yellow sweater is so bright and cheerful.. i adore your necklace nicole! Me love'ths your outfit!!!! It was 100 on wed, and has been 50 for past two days....HOLY 50 CHANGE - no lie!!! So i feel ya! i know i may be WAY late on this one - but i just saw u have a HUGE ring on - ur engaged?!?>! - CONGRATS babycakes! while it may not be warm where you are, you look fabulous! Love how you layered the sweater over the shirt and damn, those heels area amzing! I love this look! And you reminded me that I have that necklace in white. Looks so good.. must whip it out again! Tell me about it!!! This weather is weird right now!! Lol, I feel the same way - stinkin weather - my emotions can't take it anymore!! Love this outfit though!! Love your yellow sweater! It's overcast again here today and I'm already curling up by the fire! Can't wait for it to get warm again--enough of June gloom! Have a wonderful weekend! I hope your yellow calls out the sun - it's just no summer without it. You look so business, yet so cool and casual!!!! Great post!! always rocking the most unique and interesting SHOES...love those AW's. Hope you woo the sun here in Jersey too....first day I planned to hit the beach..and its raining..sigh. Frankie I thought you had a bow tie for a second but not! Great necklace and this touch of yellow is great, breaks the uusal black and white combination! The shoes and necklace are killer! Amazing outfit. I hope that you get some warm sunny sunshine over the weekend. Loving that you match the sign behind you, and loving the yellow. I think we all need a little bit of yellow in our wardrobes. The weather's been funny here as well. Love this outfit even though it didn't win the weather gods over. Maybe next time. Wow, fantastic outfit! Love those shoes and the sweater!